What broker do you use to trader international stocks? I mostly use Interactive Brokers, but for stocks like this I use Binck (a Dutch broker) since they offer better access to the smaller European markets. Do you mean Conduril is not available on IB? Is this investment idea based on just quantitative figures? Can you speak Portuguese? 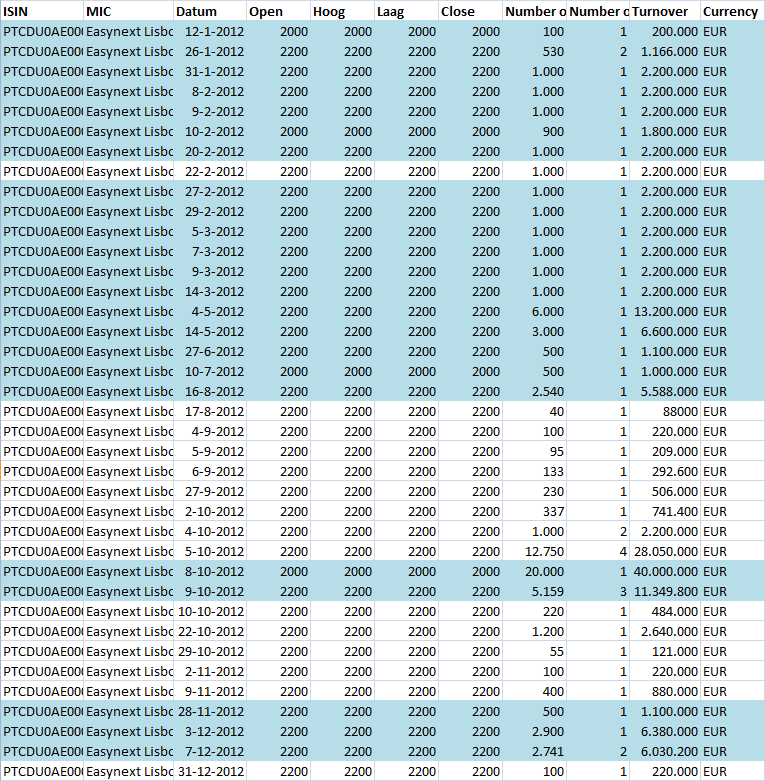 Just to let you know, your average FCF number didn’t update to take into account 2012. This may be true of some of your other numbers too; I didn’t check. Average dividend/share also misses 2012, the other numbers are correct. Tnx for noticing. Thanks for sharing this idea. Since you asked, I would like to point out a risk. Receivables and payables are huge in relation to the rest of the balance sheet. That makes sense. A lot of work in progress and suppliers get paid when the client pays Conduril. One risk though is that a client doesn’t pay. Governments in Africa are not always stable. With a major client, that would wipe out the equity in one fell swoop. Unless they “isolate” their projects. Meaning the suppliers of that project don’t get paid if the client defaults. Management seems highly competent and I would assume they do that. But…. I would have to know for sure to sleep well owning this stock. I don’t know exactly how they have structured their liabilities, but my base case is that liabilities will not disappear when there is trouble in paradise. But most of their work is done for local governments, mainly Angola. They have a BB- credit rating which is reasonable solid for a frontier market. I don’t think their credit risk is so extreme that it warrants a huge discount. Good idea by they way to try to figure out how much, if any, of their liabilities are non-recourse to the parent company. I know it’s been a while, but I just noticed that your FCF/share number is also not updated for 2012. That may also be true for other numbers. On a more important note, I was wondering where you got the 7.511 million in long term debt. I’m looking at the company’s 2012 Annual Report in English, and there seems to be 6.866 million in “financing obtained” under non-current liabilities. Incidentally, the number I see for current liabilities also seems to be a bit different from yours, which throws off the total liabilities number. Anyway, none of this significantly changes the thesis for investing in Conduril, but I thought you might want to know. I know, you already pointed out that the FCF/share number wasn’t correct ;). Your observation about the difference in long term debt is interesting. Just looking at the English AR, and I think they quietly restated some numbers. Basically every single number that I have in the above spreadsheet isn’t an exact match anymore with the latest published financials. 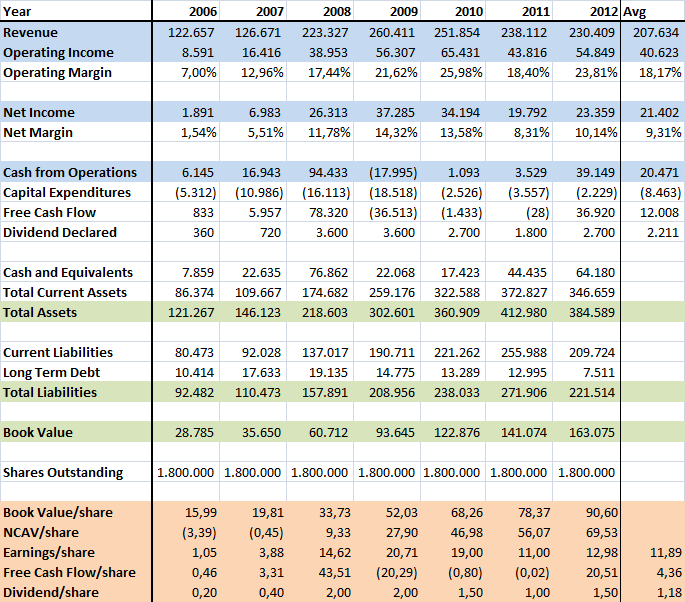 Revenue, earnings, short term debt, long term debt, cash flow: everything is slightly changed. Anyway, your comment about a restatement makes sense, though do you know why the company might have done so? I’ve never seen anything like this with an American company, though it’s possible I just haven’t noticed. In any case, the restatement is obviously not major, but I do find it curious.